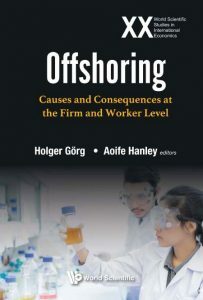 This volume brings together research papers dealing with the causes and consequences of offshoring. The first part considers causes and motives of offshoring. Using firm level data for countries such as Ireland, France, and the UK, this book looks at issues such as the increasing availability of business services or the internet, and improvements in intellectual property rights protection as stimulants of offshoring. The second part then looks at the implications of offshoring for the firms involved. Based on firm level data for Ireland, Sweden, the UK and a number of Emerging Market Economies, the book also focuses on productivity effects of offshoring as well as the implications for innovation activities of firms, and for profitability. The implications for workers of offshoring are dealt with in the third part of the volume. Studies are based on individual level data for Germany, Denmark and the UK and look at implications for individual level wages, in particular considering the importance of skills and occupations.